White Chocolate Raspberry Macarons - Let the Baking Begin! White Chocolate Raspberry Macarons are made with Italian Meringue Macaron shells, White Chocolate Ganache, and a fresh raspberry. The flavor of macarons can be customized by changing the raspberry to any other berry or fruit. Macarons are tiny little confections made of almond flour and meringue, then filled with different fillings to bring out new flavors and make these little cookies irresistibly addicting. The combination of White Chocolate and Raspberry in these macarons is what made me fall in love with macarons more than 10 years ago. The first time I made this flavor combination was ages ago, but over the years I have perfected my macaron baking technique and the white chocolate ganache filling, searching high and low for the best and finally I’m sharing these gems with you. As the macarons are allowed to sit in the fridge and mature (this is when the shell gets married to the filling :D)) the moisture from the filling softens the inside of the macaron, giving you the iconic gentle crispness of the shell exterior and a beautiful, velvety smooth interior. This flavor combination is absolutely magical. Just try it for yourself and you will see! While macarons might not be anything hard to make for someone who’s honed the technique, they can be quiet challenging and nerve-wracking for someone trying to make them for the first time. 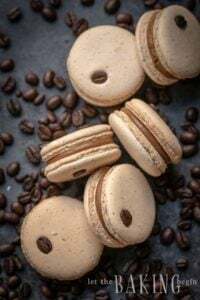 In this post about Basic Italian Meringue Macarons I have laid out everything I know about macarons, so I highly recommend you read the post several times if this is your first time attempting the macaron game. 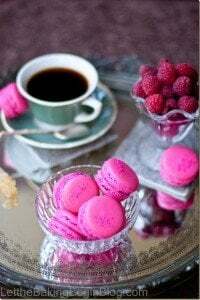 That is your first step to success with these raspberry macarons or any other macaron! The White Chocolate Ganache filling is pretty universal and can be used as the basis for the filling, but adding a different berry, like a strawberry, blackberry or even blueberry can give you the freedom to create your own favorite variety. You do want a berry or fruit that is on the tart side, as this will best compliment the sweetness of the shell and the white chocolate filling. Make one recipe of White Chocolate Ganache first, as it needs time to chill in the fridge before using it in this White Chocolate Macarons recipe. Then, make the Raspberry Macaron Shells following this recipe for Basic Macaron Shells. In step 6 of the recipe, add some pink gel food coloring for pink colored macaron shells. This is what your macarons should look like once baked. 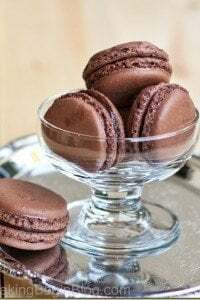 If you have overbaked the macarons or if you would like to speed up the process of maturation of macarons, dip or brush the bottoms of each macaron into some syrup, or condensed milk (not sweetened condensed milk) before filling. Then, fill a piping bag fitted with a large round tip and pipe a ring on the bottom of 1/2 of macarons. Put a raspberry inside the piped white chocolate ganache ring and cover with a matching by size other half. 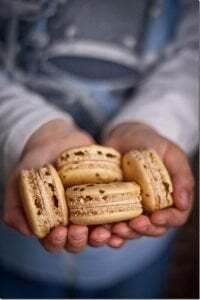 Fill them generously, because after 24-48 hours the filling layer shrinks as the moisture is absorbed into the macaron. 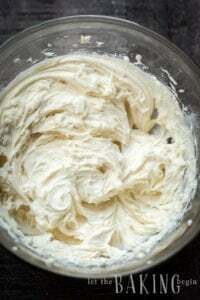 Refrigerate, tightly covered for at least 24-48 hours for best flavor and texture. Check out my other MACARON recipes HERE. White Chocolate Raspberry Macarons are made with Italian Meringue Macaron shells, White Chocolate Ganache and a fresh raspberry. The flavor of these meringue cookies can be customized by changing the raspberry to any other berry or fruit. Make one recipe of White Chocolate Ganache first as it needs time to chill in the fridge before using in this White Chocolate Macarons. Make the Raspberry Macaron Shells following this recipe for Basic Macaron Shells. In step 6, add some pink gel food coloring for pink colored macaron shells. If you have overbaked the macarons or if you would like to speed up the process of maturation of macarons, dip the bottoms of each macaron into some syrup, or condensed milk before filling. Then, fill a piping bag fitted with a large round tip and pipe a ring on the bottom of 1/2 of macarons, trying not to go too close to the edge of the macaron shell. Put a raspberry inside the piped white chocolate ganache ring and cover with a matching by size other half. Ideally, you want the filling not to come out further than the edges of the macaron shells. Thank you Lana! Just put them in a ziplock and they should be fine, or cover tightly with plastic wrap. Hiw much cocoa powder do we need for this recipe? This recipe doesn’t use any cocoa at all. 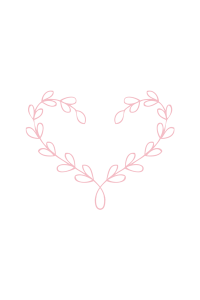 The color of the shells is a weird shade of pink, but combined with almond flour that was made with unpeeled almonds, it has a bit of a brownish hue. White Chocolate Ganache - Let the Baking Begin!